You've likely heard the stories of people finding classic cards in tobacco tins buried in the backyard, used as wall insulation or left in trunks in grandma's attic. The 'Black Swamp Find' in Ohio could trump them all. Recently, a stash of about 700 1910 E98 baseball cards were discovered in a box under an old dollhouse. The original owner of the cards, Carl Hench, had passed away and his heirs made the discovery during their cleanup. While the find of rare cards would have been remarkable itself, what makes the find even more special is the cards' condition. Most graded out at PSA 7 or better. 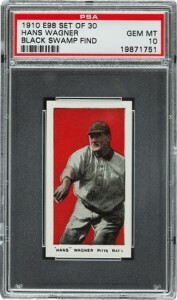 "Before the find, the highest grade ever achieved by an E98 Ty Cobb was PSA NM 7. A single copy reached that level after 21 years in business," said PSA President Joe Orlando in a press release. "To put this find in proper perspective, this discovery produced 16 PSA Mint 9 E98 Cobb cards alone." A E98 Honus Wagner from the collection was graded a PSA 10. 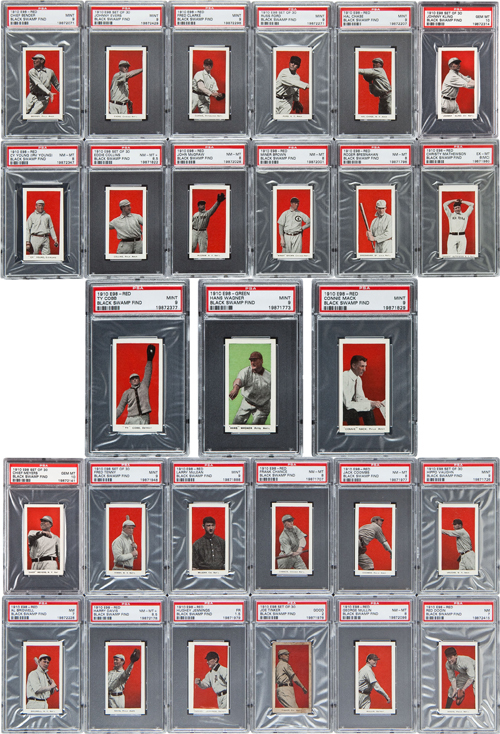 A total of 37 of the cards are set to hit the auction block at the 2012 National Sports Collectors Convention on August 2. The initial lot is expected to bring in around $500,000. Heritage Auctions is handling the sale. They will offer more cards from the collection during future sales. The total collection could be worth more than $3 million. To note the cards' provenience, PSA labeled the slabs 'Black Swamp Find,' referencing the nearby area that helped protect Ohio's Fort Defiance in the 1790s. The E98 set has just 30 cards. However, more than half of the checklist consists of Hall of Famers. Besides Wagner and Cobb, highlights include Cy Young, Christy Mathewson and Nap Lajoie. 1910 E98 FRED CLARKE SGC 20 !! Harold Miner Brown 1910 E98 Black Swamp Find RED SGC 86 7.5! Only 1 PSA Higher! This find has been a great shot in the arm for the hobby. Finally we aren’t getting coverage without “the hobby is dying” being the focus. I was lucky enough to be interviewed by the local NBC station and it has led to a number of “I found these cards in my attic” collections being brought in. I hope other stores have benefitted as well.